Finally: The NBA playoffs. A six-month, 82-game regular season is only a prelude to the things that matter. All the regular-season drama — the Lakers‘ disasters, the Anthony Davis trade rumors, the grand finales for Dirk and D-Wade — no longer matters. All that matters is what happens now. So we’re diving into some of the big questions and big predictions in what promises to be an intriguing playoffs. As much as you think you know what’s going to happen — as much as you think the Warriors are about to go 16-0 — odds are that you’ll be very, very wrong. 1. Which high seed faces the biggest risk of getting bounced in the first round? Reid Forgrave: The Nuggets. Yeah, I know this will be a popular upset pick. But it’s for good reason. The Nuggets are a team with next to no playoff experience playing against a team coached by Gregg Popovich. All the Spurs have to do is win one game in Denver — not an easy task by any means — and I’d pick them in this series, because the home-court advantage in San Antonio this season is almost equal to the home-court advantage in Denver. It would be a shame to see the Nuggets, one of the most impressive stories of this NBA season, go out in a flash. But it would also be a much-needed learning experience for the second-youngest roster in the NBA. 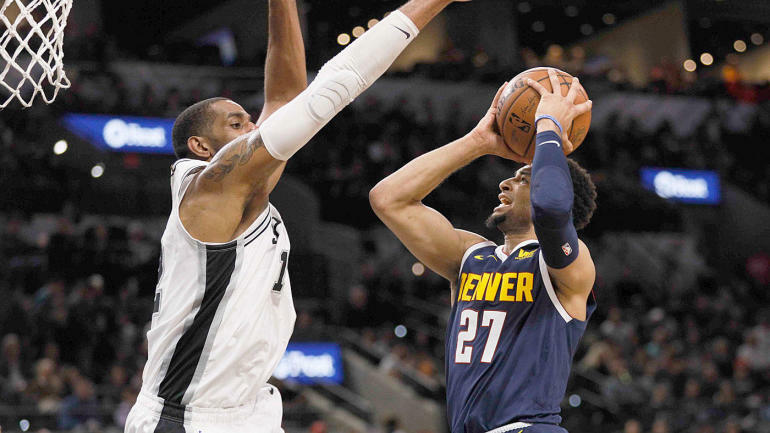 Chris Bengel: The Denver Nuggets may have come away with the second seed in the Western Conference, but that doesn’t mean that they aren’t on upset alert. The San Antonio Spurs are playing some tremendous basketball as the postseason begins and the situation is a little bit different this time around. The team wasn’t banking on having Kawhi Leonard and can depend on their dynamic duo of LaMarcus Aldridge and DeMar DeRozan to help shoulder the scoring load. This definitely could be a series that goes six or seven games. Michael Kaskey-Blomain: The Denver Nuggets secured the second seed in the West, but they haven’t been playing great basketball, as they have gone just 5-5 over their last 10 games heading into the postseason. They are a team without a lot of playoff experience going against a team — and specifically a coach — with ample experience in the postseason. The Nuggets are the youngest team in the playoffs, and it wouldn’t be shocking to see the Spurs take advantage of their inexperience. 2. Who has the most favorable path to the NBA Finals? Forgrave: The Warriors — and not just because they are the Warriors. The West just isn’t this year what it has been in recent years. It won’t be easy, certainly. A second-round matchup with the Houston Rockets, who nearly upset the Warriors in last season’s Western Conference finals, looms. But get past the Rockets (which the Warriors should, once they flip that playoff switch) and it should be smooth sailing until the Finals. None of the potential Western Conference finals matchups are particularly concerning. Bengel: The Golden State Warriors have a favorable path considering that they have the home-court advantage throughout the postseason. The team is even more loaded than a season ago with DeMarcus Cousins offering a different dimension to the offense. It’s going to be extremely difficult for any of their Western Conference counterparts to win multiple games at Oracle Arena. Kaskey-Blomain: I have to go with Golden State as well. By securing the top seed in the West, the Warriors made sure that they would have home-court advantage throughout the Western Conference finals, which will benefit them. Their toughest competition may come in the second round in the form of a matchup with the Houston Rockets, but Golden State has the talent to topple any team. Ultimately, if they’re healthy and playing their best ball, they should be able to come out of the West. 3. Conversely, who has the most difficult path to the NBA Finals? Forgrave: Other than the seven Western Conference teams who would have to get through the Warriors? I’m picking the Philadelphia 76ers. That first-round matchup against the dead-solid Brooklyn Nets is likely the toughest first-round matchup for the four best teams in the East. (No offense to the Pacers, who are an incredible story, but they’re just not the same team since Victor Oladipo’s injury.) After that, they’ll potentially have to get through a Raptors team that’s built for the postseason (and has been plotting its entire regular season around being tough in the postseason) and a Bucks team that’s been the best team in the NBA since the beginning of the year — and that should be fully healthy. A tough ask for a Sixers team that’s already looking at a dinged-up Joel Embiid going into the first round. Bengel: The Philadelphia 76ers may have completely transformed their roster, but their path to the NBA Finals isn’t exactly an easy one. Philadelphia will have to take down a pesky Brooklyn Nets squad in the opening round, followed most likely by the Milwaukee Bucks and Toronto Raptors in the semifinals and conference finals. The Sixers have defeated the Bucks this season, but had their fair share of struggles against the Raptors. If they want to earn the right to reach the NBA Finals, they’re definitely going to have to earn it. Kaskey-Blomain: By falling to fourth in the East, the Celtics have a potential path through three of the other top five teams in the conference. They start out against a tough, well-coached Indiana Pacers team, and if they are able to get past them, the top-seeded Milwaukee Bucks could be waiting. Then, if they were able to get to the conference finals, they would have a likely matchup with either the Toronto Raptors or Philadelphia 76ers. 4. Among the eight first-round matchups, which one has you most intrigued? Forgrave: Blazers-Thunder (with two honorable mentions: Nuggets-Spurs, and Celtics-Pacers, especially with Marcus Smart’s injury). The Blazers are a year removed from last year’s 4-0 embarrassment at the hands of the New Orleans Pelicans. Now, they have an absolutely brutal first-round draw against an up-and-dpwn Thunder team that’s won five in a row. And they’re going to have to go up against Steven Adams without starting center Jusuf Nurkic. Bengel: The Houston Rockets-Utah Jazz series could be one that is very entertaining and goes six or seven games. The Portland Trail Blazers leapfrogged the Rockets to earn the No. 3 seed in the West and now Houston will have to fend off Utah. James Harden has played out of his mind this season, but Rudy Gobert could pose a tremendous challenge inside when Harden decides to put the ball on the floor. Houston likely won’t take Utah lightly after the Jazz came away with an upset win over the Oklahoma City Thunder in the opening round a season ago. Kaskey-Blomain: Portland Trail Blazers vs. Oklahoma City Thunder. These two teams don’t really like each other, and they will both be motivated to make some noise in the postseason after disappointing first-round exits last year. Plus, the individual matchup of All-Star point guards Russell Westbrook and Damian Lillard promises a lot of excitement.